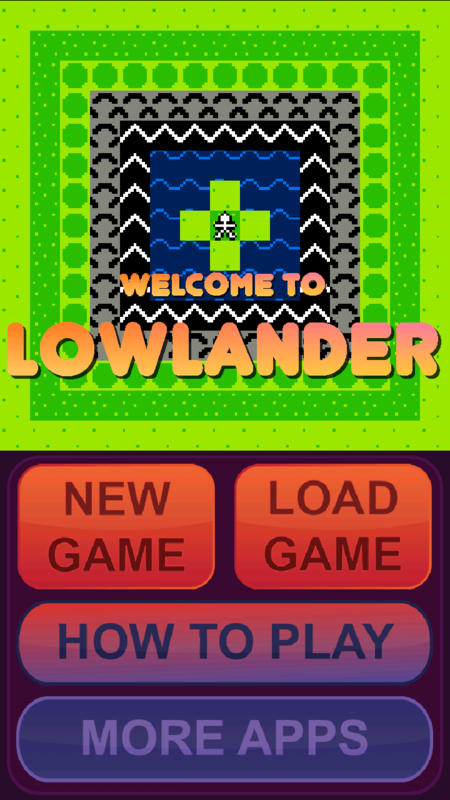 Earlier this week the Ultima Codex posted about a new Ultima II inspired RPG available on iOS and Android called Lowlander. This looked like a game that could have been built with me in mind so I didn’t hesitate in putting the $2 down to pick it up. Three days later, I’ve managed to finish it and thought I’d pop up a quick review. Since this is a brand new game, I’ll try to avoid too many spoilers and just concentrate on the gameplay. The Ultima influence is immediately apparent on entering the world and anyone who has played the original trilogy should be immediately at home. The influence only goes as far as gameplay mechanics however, so no copyright infringing Ultima characters or places make an appearance although it does get close on occasion (E.g. Theeves Den). The interface has thankfully been streamlined for a modern audience with the biggest addition being an automap on the middle right of the screen. There is the option to enlarge the map to fill the game-window section of the screen + 4 levels of zoom available to select from. 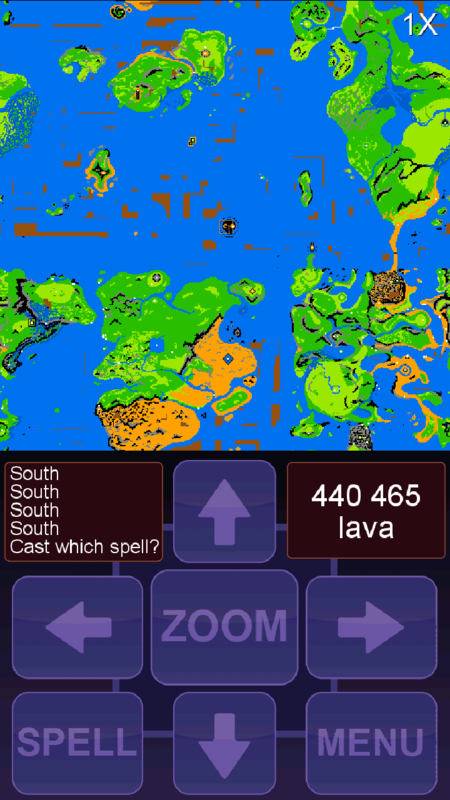 The world is roughly 500×500 tiles and the automap is a godsend when finding your way around a land of this size. A lot of the fun in the game comes from exploring the unfamiliar world and I spent a lot of time on this screen looking for areas I had missed. Unlike Ultima II, the player can only carry a finite amount of equipment. 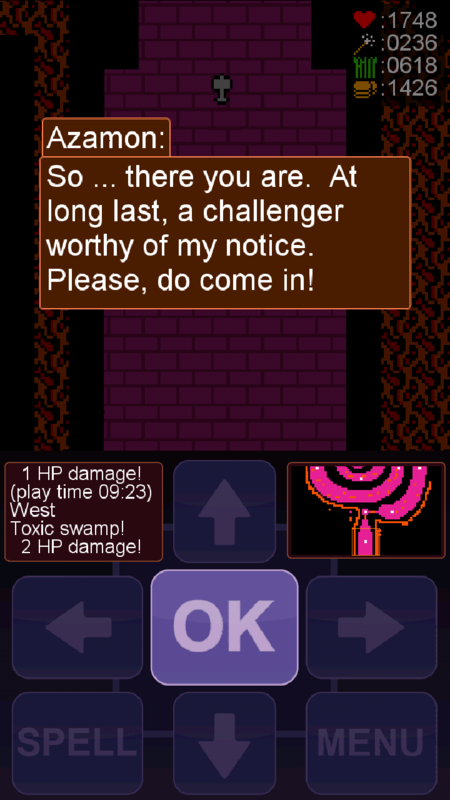 This led to me throwing away endless lockpicks or antidote potions later in the game but does add a degree of realism. Money was only an issue early in the game and eventually rolled over the 4 digits available long before I got to the end (Luckily for me the game still kept the correct amount in memory and just missed off the fifth digit). 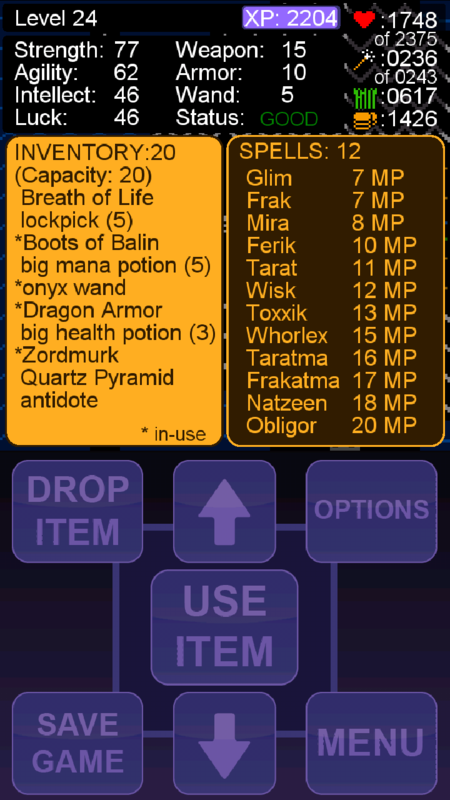 The spells on the right hand side are gradually made available as the player levels up – many of these are the usual sorts of healing/cure poison spells you might expect but there are a handful of more unusual options. The stats are relatively simple and it’s nice and clear what they actually do. Strength is how much damage you do in combat. Agility is how often you hit. Intellect is how effective spells are and luck is how likely chests are dropped, or the player gets poisoned/frozen in combat. On levelling up the player receives 1-3 points in every stat and gets the option for a further boost in one of the four. I concentrated entirely on strength in the early game before moving over to agility later on. In hindsight a mix of the two would probably have been the way to go but the levelling system used forces a fairly balanced character ultimately. Spells cost a given amount of mana but unlike most Ultimas this doesn’t recharge over time. Instead it can only be regained by visiting a healer or through the use of mana potions. As such, I don’t think I’d want to play a heavy magic user as I can imagine my mana running out in some of the dungeons all too rapidly. Spells always hit their target though so it might have balanced out if I’d put my money into intellect instead. 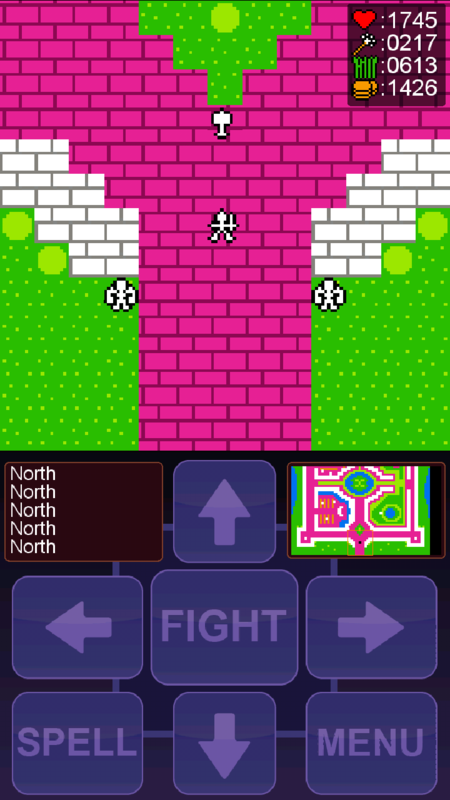 Numerous towns and castles are dotted throughout the land and just like any good Ultima, the player needs to explore all of these to get the information needed to beat the game. Most of the characters just have a single line of text but there are more verbose citizens to be found with quests and clues that will send you all over the map tracking down items. The conversations aren’t entirely serious and very much in the vein of Ultima 2. E.g. There is one town full of people telling you their favourite films/books which I assume reflect the tastes of the games author. It’s all good fun and provides variety from the combat. 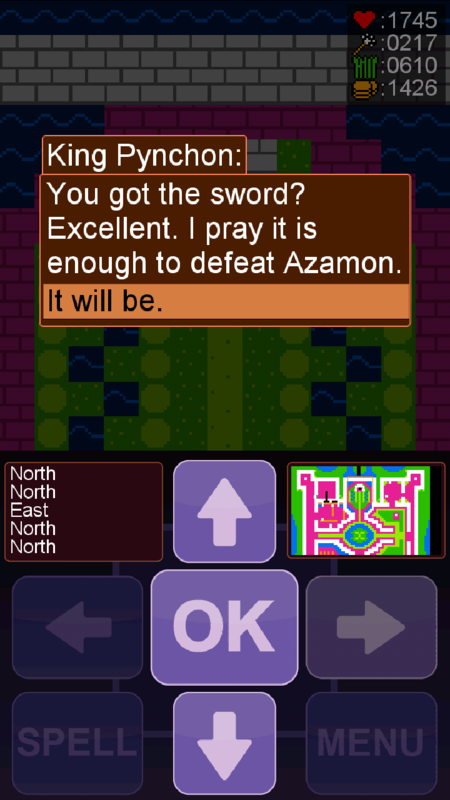 The main plot involves defeating the evil Sorceress Azamon. There is a little backstory but her main crime for much of the game seems to be stealing the head of a statue in one of the towns. I won’t give any more away here but the plot isn’t really a major component. There is more going on than in Ultima 1-3 but the emphasis is very much on exploration and dungeon delving. I will say that Lowlander is a whole lot kinder than any of those games with quests and hints to prod the player in the right direction and the whole game being more structured allowing greater freedom in stages. I only once found myself stuck but it didn’t last all that long – in hindsight the clue was in the game if I’d only picked up on it. It wouldn’t be a fantasy RPG without dungeons. 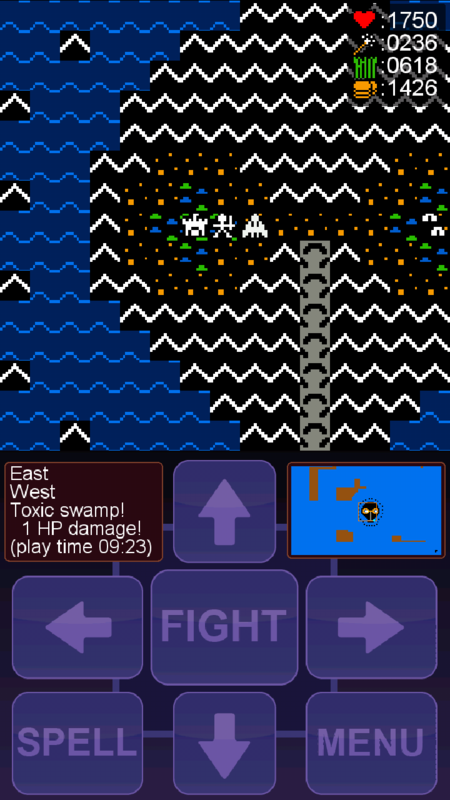 Here Lowlander breaks away from Ultima and sticks with the 2D overhead view. Typically there will be a key somewhere in the dungeon that is needed to open a distant door right at the other end. These dungeons are sizable and the automap proves indispensable here – you really need to explore near enough every corridor. Thanks to that automap, this is very rarely frustrating. There are 2 or 3 dungeons in which the players torch/light spell only illuminates a single square including one particularly nasty maze-like level full of dead ends which must have taken me about 40 minutes. 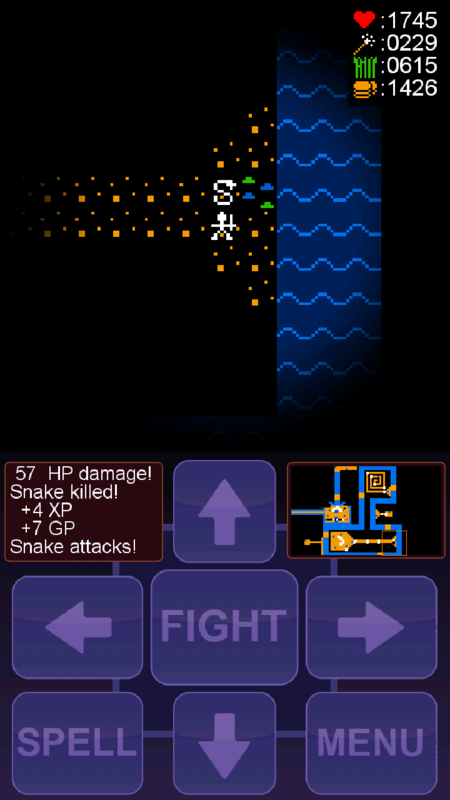 There is no saving in dungeons but the difficulty isn’t pitched too high and the well prepared player should never find them too much to cope with. I really enjoyed playing this and it took me over 9 hours of game time (not including restoring) to beat it making the asking price look extremely reasonable. The early stages are a little unforgiving and probably the only time I had to deliberately grind for experience but it’s nothing compared to the early stages of some RPG’s I could mention. Any Ultima veteran will not have any real difficulty once they learn the lay of the land. Survive for long enough and the game concludes with the player assaulting Azamon in her castle in a fitting finale. There are a couple of minor quibbles. The sound is nothing to write home about, just a few sound effects here and there. That’s fine for a mobile game but I could have lived without the low health sound which you will hear every time your player moves if your health drops below a certain percentage. You really don’t need this if the nearest town is a long walk away. 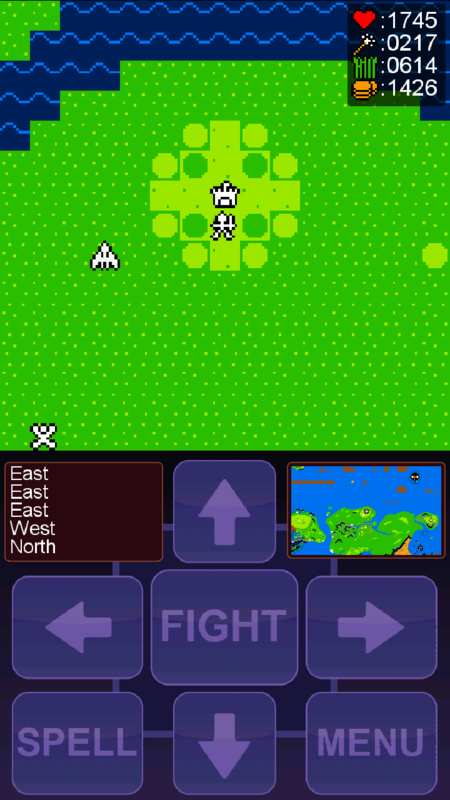 I also got some minor slowdown playing on a Galaxy Note 2 on the world map. This tended to be well into longer gameplay sessions and I’m putting it down to the build-up of monsters the game had to keep track of. I found that Lowlander really chewed through the phone battery as a result, far more than I would expect for something this simplistic. Other than that, I loved it. I’d say the gameplay was just about perfectly balanced throughout and really captured the spirit of what it was like playing an Ultima for the first time. There aren’t any game guides up on the web yet so I was entirely on my own figuring everything out which ultimately added to the experience. It’s all too tempting to get answers via Google these days when you get stuck and I would have succumbed if it had been an option. Anyone who enjoyed the early Ultimas or other RPG’s of the era should try this out. I could imagine some Ultima fans being put off by it being inspired by Ultima II (it is usually most people’s least favourite in the series after all), but this is a far better game by modern standards and perhaps recaptures the spirit what it would have been like playing Ultima II back in 1982 before we all knew better. Despite using the Ultima gameplay formula, it is still far enough removed to stand on it’s own and no knowledge of the series is required. I gather that the iOS release has been temporarily pulled while some bugs are fixed but the Android version ran fine for me and is available on the Play store for about $2. This entry was posted in Lowlander by Pix. Bookmark the permalink.